This chapter describes, in detail, the method our laboratory developed to differentiate L. donovani promastigotes into amastigotes in a host-free culture. This method is based on previous observations that Leishmania promastigotes can combine two environmental signals, typical to lysosomes, acidic pH (~5.5) and body temperature (37 °C), into a signal that induces differentiation. Based on this concept, we have modified medium 199 to make it into an amastigote-specific medium. Shifting promastigotes to this medium, followed by incubation in a CO2 incubator, induced differentiation. Axenic amastigotes reach maturation within 5 days, resembling the time it takes in vivo. 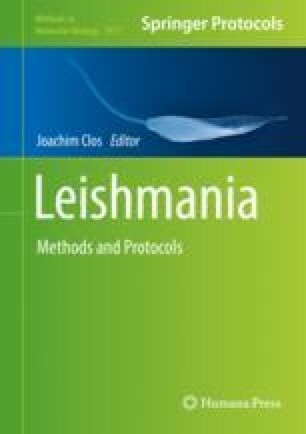 This chapter provides a complete protocol that should be useful for both Old and New World species of Leishmania.